Most people know how important pectorals are to the front of their body. They would never slack on chest day, or just not include one in their routine at all. But few people realize how important traps are, and if they do, they tend to focus only on the upper portion that's visible in the mirror from the front. But your traps form a kite shape, running from your neck to your mid back, and the lower portion is just as important as the upper when you're seen from behind. In "The Encyclopedia of Modern Bodybuilding," Arnold Schwarzenegger describes the traps as the visual center of your back, and as important for an impressive back as pecs are for an impressive front. The upper traps are easy to hit on shoulder day, but these exercises will help you build those difficult-to-target lower traps that will tie your physique together. The leaning shrug, also known as the silverback shrug, is about the closest you can get to isolating the lower traps. 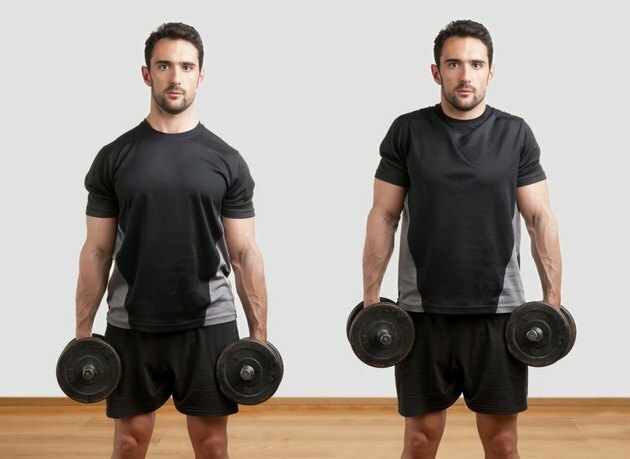 With the standard shrug, you hold a barbell, stand upright, and shrug your shoulders as high as you can. The upper traps are responsible for this motion. The lower traps retract your shoulder blades, pinching them together, so the farther you lean over, the more you'll utilize your lower traps. You'll probably find a 30- to 45-degree angle to be the most comfortable. Shrug your shoulders straight up toward the ceiling. Your upper traps are very tough, often requiring a higher rep range of up to 20. Your lower traps may only need 10 or 12 reps per set. To remove balance from the equation, this exercise is easiest to perform on a Smith machine. Dorian Yates has one of the all-time greatest backs in the history of bodybuilding, so of course he invented his own row. The Yates row is like a standard barbell back row, except that instead of leaning forward as close as you can to parallel, you only lean forward about 30 degrees. Though Yates held the bar with an underhand grip, hold it with an overhand grip to minimize bicep activity in the exercise. Pull the bar to your stomach, hold it there for about one second, consciously pinching your shoulder blades together, then release. Perform this exercise in the bodybuilding rep range of eight to 12. The traps retract your shoulder blades. In order for your shoulder blades to fully retract during a row movement, your hands must go further back than a barbell or cable allows. To perform a one-arm dumbbell row, kneel with one leg on a bench and one arm supporting you. The other foot is on the floor, and your other arm holds a dumbbell. Your upper body should be just about parallel to the floor. Allow the dumbbell to drop toward the floor and feel a strong stretch in your back. This stretch is important to get a full range of motion from your trap. Pull the dumbbell in until it rests beside your stomach. Your elbow should be past your back, and your shoulder blade should be fully retracted. Perform this exercise with each arm in the bodybuilding rep range of eight to 12. In his classic book "Ultimate Bodybuilding," Joe Weider suggests that because the traps are tough, you should consider super-setting your exercises. For instance, perform a set of Yates rows, then immediately transition into a set of leaning shrugs, then rest.